I’ve written many times that the El Poblado sector of Medellín, Colombia, is considered to be the best area of the city. And for most expats and travelers, that remains true. But El Poblado is certainly not the first choice for everyone. 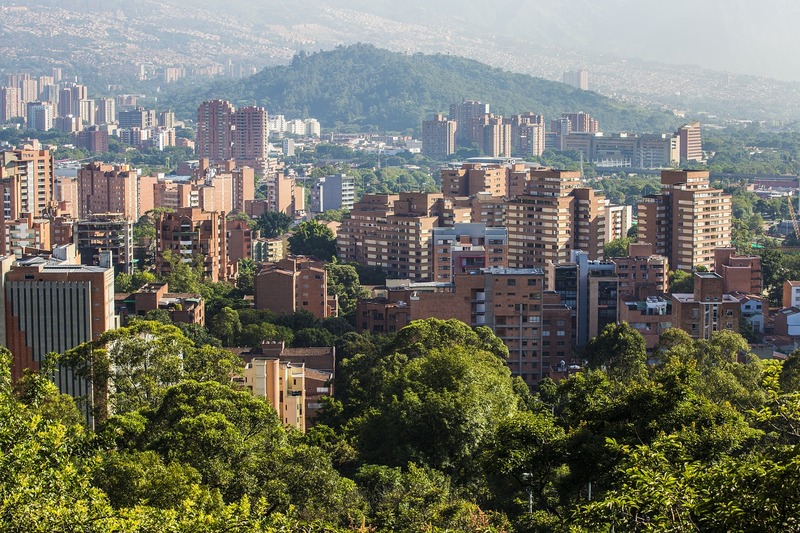 Medellín has a number of equally desirable (and less expensive) areas that are gaining increased attention. The neighborhood of Laureles is one of my favorites in the city. Laureles offers lush, tree-lined streets in a sector crisscrossed by a few shady, divided boulevards. Among its streets you’ll discover a terrific selection of cafés, restaurants, services, and shops. 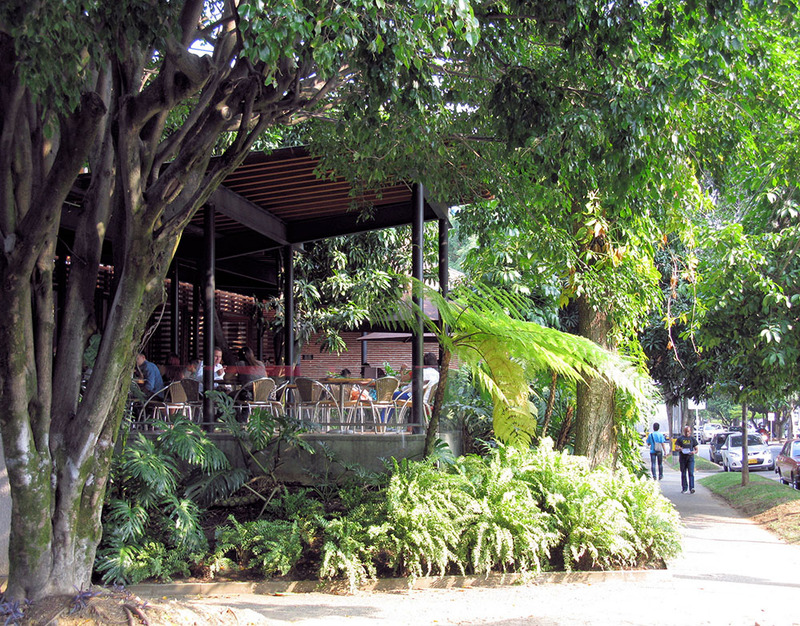 There are also two attractive, wooded parks where you can relax and watch the rest of Medellín go by. The layout of Laureles is unusual when compared to most of Medellín… or most of Spanish America for that matter. Instead of the normal grid of north-south and east-west surface roads, most of Laureles’ streets are laid out as two sets of concentric circles and spokes; one centered on Segundo Parque Laureles and the other centered on the university. To complicate your orientation further, its main thoroughfare (Avenida Nutibara) runs diagonally through Laureles. And while much of Laureles is less expensive than El Poblado, it’s not a downscale option; Laureles has the second highest income level in Medellín after El Poblado. And I believe Laureles offers a few advantages over El Poblado, as well. First, it’s relatively level. In El Poblado, we’re on a mountainside, and east-west travel will give you a good workout. In Laureles, you can walk all around the zone without climbing hills. Also, it does not have El Poblado’s business environment. 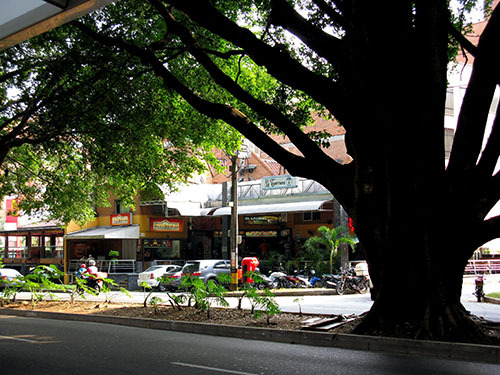 While El Poblado’s Golden Mile is a major center for business and finance, Laureles is mostly residential, with businesses that are small-commercial. So while you’ll find everything you need to live there, I think it retains a nice neighborhood feel. And you won’t see many tourists in Laureles. Virtually everyone who visits Medellín from around the world has El Poblado at the top of their list. If they’re in town long enough, they might get over to Laureles… or maybe they won’t. Most of the people you see in Laureles are those who live here; or who came to the sector from neighboring barrios to enjoy its restaurants and cafés. Like El Poblado—and all of Medellín—Laureles enjoys what many of us believe to be the world’s best weather. The average high temperature in the valley is 82ºF (27ºC), with an average low of 63ºF (17ºC), and only one degree of seasonal variation. Importantly, there’s no need for a car in Laureles. It’s 100% walkable. In my book, Laureles is the perfect blend of shady, treed residential areas and attractive city amenities… with lush mountains to the east and west. Property prices and taxes in Laureles are somewhat less than in El Poblado, and utility rates—which vary by neighborhood—will also be lower here. That said, the discount you get in Laureles is small… you won’t save enough on taxes and utilities to make or break your decision to live there. Here are a few examples of properties on the market today. A 114-square-meter (1,227-square-foot) custom-built, three-bedroom, two-bathroom apartment is conveniently located near Laureles shopping, nightlife, the Metro, and the popular Estadio sports complex. Occupying the top floor of a three-floor building, this unit enjoys low operating costs and price. The asking price is US$89,700 (270 million pesos). A spacious, two-level apartment in the heart of Laureles has 197 square meters (2,120 square feet) of living area, including four bedrooms and two bathrooms, occupying the first and second floors of a five-story building. The master bedroom suite has two balconies, each with leafy views of the shady surroundings. A garage space comes with this six-year-old property for the asking price of US$133,000 (400 million pesos). Located directly in front of the Segundo Parque in Laureles (where some of Medellin’s best restaurants and nightlife are located), I found a 141-square-meter (1,517-square-foot) apartment for sale, with three-bedrooms, two bathrooms, and a nice kitchen with modern touches. Parking for two cars is included with this third-floor unit, built in 2015 and listed for an asking price of US$136,000 (410 million pesos). A modern, new, 118-square-meter (1,270-square-foot) Laureles apartment is centrally located, with all of Laureles’ points of interest a short walk away. The apartment has three-bedrooms, three bathrooms, a state-of-the-art kitchen, and a balcony from which you can enjoy your ninth-floor views of the surrounding mountains. The asking price is US$183,000 (550 million pesos). If you’d like to scout properties in Laureles, contact Rich Holman, founder of First American Realty Medellín. His Laureles properties sell quickly… and he can assign a bilingual agent to do some digging for you. If you speak Spanish, try contacting Marjorie White. Marjorie is a Medellín native and realtor who lives in Laureles. Laureles traditionally did not have much of an expat community, but that has changed over the past few years. Now it’s rapidly gaining popularity with expats. The only disadvantage that I can think of in Laureles is for those who want to manage a rental property. There’s a solid market for rentals, but your occupancies will probably be higher near Parque Lleras and the Golden Mile in El Poblado. Otherwise, Laureles is a premier option in Medellín. With its tranquil, tree-lined streets, green parks, restaurants and cafés, and a genuinely laid-back, neighborly feel, Laureles is hard to beat. I’ve been reading you for years and we exchanged a few emails years ago. My wife and I have lived in various countries over the past 50 years and are now looking for the ideal place to spend our few remaining years. Cuenca keeps reappearing on my radar. We are planning a first visit before the end of the year. My question is can you please give me the names and contact details of your dentist and dermatologist in Cuenca and any other info on the hospitals, etc.? There’s an excellent chance you’ll like Cuenca, Ecuador. It’s one of the most popular expat venues in the Americas nowadays. When I moved to Cuenca in 2001, it took six months to meet our first English-speaking couple. You felt like a real pioneer in those days. Today, with thousands of expats in residence, it’s quite different. You won’t be a pioneer… but the city is now rich with cafés, restaurants, and events. To get a feel for the city, have a look at Cuenca Expats Magazine. It’ll give you a feel for the lifestyle you’ll find in today’s Cuenca. The best site I’ve found for news and practical information is Cuenca High Life. The medical care I received in Cuenca was first-rate, at Mount Sinai; one of three excellent private hospitals in the city at that time. Since I moved away, I’m told that Hospital Universitario del Río is even better. You’ll have to see for yourself. Here’s the contact info for my dentist and dermatologist, respectively. I still recommend them highly, and see them myself when I’m in town. I love Old World architecture, and your article on Álamos, Mexico, intrigues me. I prefer temperate areas with few bugs and mosquitos. What is the city’s elevation, and what is the weather/temperature there? P.S. We’ve been in Abruzzo, Italy, for the past three weeks, and we’re loving visiting the historical centers, eating the local foods, and interacting with the friendly people. Álamos is not a temperate area. The winters are beautiful with temperatures in the 80s, but it gets hot in the summertime. Expect high temperatures in the 90s from April through October, with the average high in June (the hottest month) hitting 100ºF (38ºC). The bugs are fine most of the year. I wasn’t bothered at all in the wintertime. But you’ll see mosquitos when the rains come, between July and September. For nice colonial architecture and a moderate climate, San Miguel de Allendewould be worth a look. It’s not quite the colonial showplace that Álamos is, but it’s cooler, owing to the altitude. It’s a good choice… unless you decide to stay in Abruzzo.